Sign up for a PADI Advanced Open Water Diver course in Padang Bai and gain specialized skills in scuba diving. You'll complete five open water dives, swimming down as deep as 100 feet in the Bali Sea. During these dives, a certified dive instructor will help you upgrade your skills and have remarkable, underwater experiences. Apart from the mandatory dives of the deep dive and the underwater navigation dive, you can also select from a list of electives like the drift dive, night dive, wreck dive and more. These electives will help you in developing expert skills in specific areas of diving. All the while, you'll be exploring magical scenes of corals, shipwrecks, pinnacles, fishes and more. With the elective of wreck diving, you can also explore the shipwreck of the famous USAT Liberty, a cargo ship that served in the second world war. 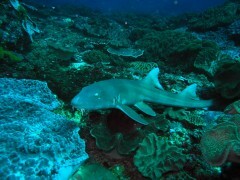 At this famous dive site, you can expect to see more than 400 different species of marine life. Rare sightings of whale sharks have also been reported at the USAT Liberty shipwreck. 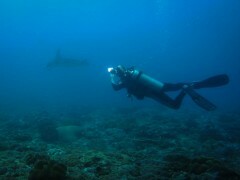 • Earn your PADI Advanced Open Water Diver certification at Padang Bai. Travellers are required to be certified as a PADI Open Water Diver before booking this scuba diving course in Bali. Consumption of alcohol and drugs is strictly prohibited during the course. Consumption of tobacco products like cigarettes is not recommended. Day 1 of the PADI Advanced Open Water Diver course in Padang Bai: 3 open water dives! Report at the dive center in Padang Bai by early morning. The day begins with a boat ride to a few of the dive sites around Padang Bai. En route, your dive instructor will refresh skills learnt in your previous certification course and begin with advanced skills that you'll be practicing today. Over the course of the day, you'll complete three open water dives, including the mandatory deep dive and underwater navigation dive. During these dives, you will work with your dive instructor to understand and learn higher skills in diving. Lunch is served on the boat between two of the dives. The day's session ends as the boat returns back to the dive center by late afternoon. You can spend the rest of the day at leisure. 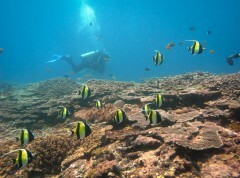 Spot brightly coloured, tiny fishes that swim the dive sites near Padang Bai. Day 2 of the PADI Advanced Open Water Diver course in Padang Bai: 2 open water dives! Report at the dive center in Padang Bai by early morning. Depending on the dive instructor, you'll either travel to a few of the dive sites around Padang Bai or go diving near the USAT Liberty shipwreck. En route, your training continues as you focus on upgrading your knowledge with specialized skills. Over the course of the day, you'll complete two open water dives, swimming down as deep as 100 feet. 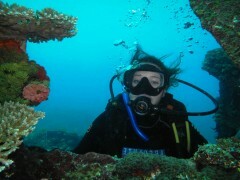 You can select the type of dive from options including drift dive, night dive, wreck dive and more. Lunch is served on the boat between the two dives. The day's session ends as the boat returns back to the dive center by late afternoon. Your trip ends here.